As its name suggests, G.I. Tanto is a no-nonsense Tactical knife that comes with a legion of practical uses. It may be lean and spare, but it delivers the goods where they count the most! the broad tanto point blade, integral Quilon guard, and polypropylene handle scales, exemplify a Tactical knife stripped down to its bare essentials. It's ground razor sharp out of 1055 carbon steel with a hard spring Temper and protected by a black, rust resistant finish so it's ready to take all the abuse you and Mother nature can dish out. Heavy, sharp and wonderfully balanced, it's easy to throw by either the blade or handle and it hits with real Vigor. In a survival or self-defense situation, it can be quickly and easily Converted into a spear or war club. Just remove the handle scales and lash the blade securely to a suitable wooden shaft! Best of all, it's a Great value. Please don't throw away hundreds and hundreds of dollars on similar knives sold by convicted felons and rip off artists posing as Elite "military operators". get the real G.I. 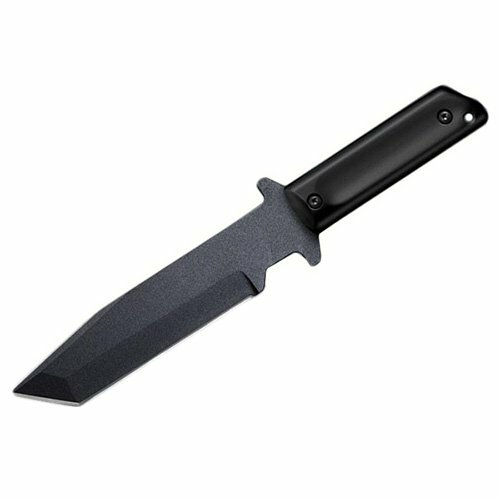 Tanto from Cold Steel and get more than your money's worth. Features:- broad tanto point blade- integral Quilon guard- polypropylene handle- ground razor sharp out of 1055 carbon steel with a hard spring Temper - protected by a black, rust resistant finish- easy to throw by either the blade or handle- easily Converted into a spear or war club specifications:- weight: 12 oz.- thick: 4mm- blade: 7"- overall: 12" - secure-ex sheath"".